Keep the fun in your training with Teaching Tricks with Josh Lyons! Stop chasing your horse around when trying to mount. 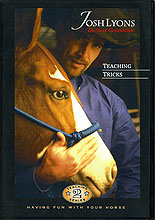 Learn how to have your horse come to you for mounting. Teach collection from the ground. Learn how to control the hindquarter without moving the front end. Everyone loves a horse that bows. Have fun learning to teach your horse to bow, lay down, and sit up, and the cue that keeps the horse in the position you need.